Recorded and mixed by Patrick Phillips at Real World Studios, Box. Strings recorded by Stuart McCallum at the Royal Northern College of Music, Manchester. Additional recording by Stuart McCallum at CSR Studios, Manchester and Paul Allen at Bass Line Audio, Bury. 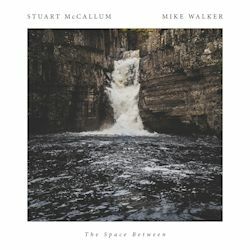 Experienced guitarists Stuart McCallum and Mike Walker have constructed an admirable 49-minute disc that marries strong themes with texturally imaginative settings. McCallum is the acoustic guitarist, Walker wields the electric instrument and they’re joined on four tracks by a string quartet. And Finally , a wittily quixotic programme opener, is equally subversive when it comes to quotations from Beethoven’s Ode to Joy though percussive raps, and the burnish of the quartet also add to the point where a ‘take off’ solo from Walker is the least expected device. Both solo instruments entwine delightfully on Alfie, affectionately voiced and with or two unashamed ‘gym shoes’. If one notes that Moment Us is a gentle and relaxed piece, quietly warmed by the burnish of the quartet, or that the duo take on the third movement of Debussy’s String Quartet, this isn’t to imply an album of ambient richness devoid of excitement. There is, for instance, the folkloric start of Yewfield with its fluid soloing or the title track’s colour-saturated thematic interest. And that’s not to cite Walker’s propensity for light rock vibes in As The Trees Waltz or indeed the standard My Ideal with its deft leasing of melody statements and charming interleaving of tone and texture. Indeed, the variety of ways in which the guitarists project melodies is one of the most consistent pleasures of an album that may seem unassuming but as the final track, Sky Dancer, shows opens up avenues of exploration. Here a more North African vibe infiltrates the music-making and McCallum’s use of electronics adds to the amplitude of the ensemble, a feel only increased when Walker takes an avid and intense solo that brings the disc to a most rousing and exciting close.